As many of us know, capital gains tax has a tremendous impact on investment. Tax Free Savings Account (TFSA) is one investment option that allows Canadians to earn tax free investment income to meet lifetime saving needs. However, all registered investment options have their rules and regulations. One of the rules of a TFSA is that it has a maximum contribution level; the maximum is $41,000 in the year 2015 if you have never gotten a TFSA before. On the other hand, Cash Flow Banking is the original TFSA that has been around for over 100 years. 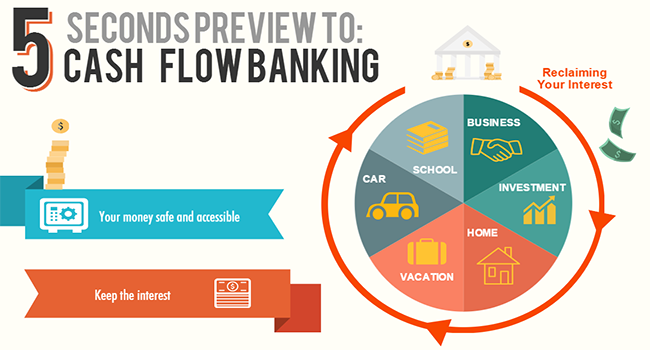 Cash Flow Banking allows policy owners to receive dividends every year and all growth is tax free. In addition, there is no maximum contribution level and you would be able to access your money at anytime, for any purpose. However, many people are afraid to commit to such an investment vehicle because there has been many misunderstandings surrounding the product, making people stay away from even trying to understand what it can do. Many individuals are aware of the death benefits of an insurance policy, but the living benefits are rarely heard of or unexplained. We assist our clients to create and control their own banking system utilizing Participating Whole Life Insurance in a way that would allow them to turn their expenses into a warehouse of wealth.